Shipboard photographers are readily available during your cruise to capture your special memories. You'll find them at character meet and greets, in the restaurants at dinner, and on Castaway Cay. Portrait sessions are also available each evening in the Atrium, with a variety of different backdrops. There is no charge for this service, you only pay if you wish to buy any of the prints. 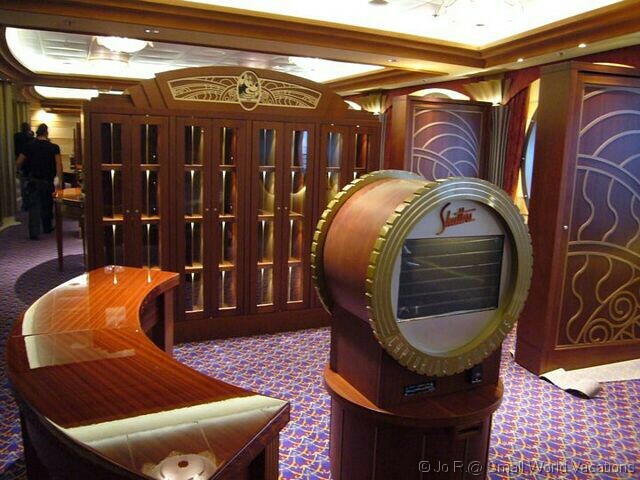 You can view and purchase your photos through the kiosks or in Shutters, located midship on Deck 4. Shutters' opening hours are posted in the Personal Navigator. Shutters also sells an assortment of digital cameras and digital photo services. When you have your photo taken by one of the ship's photographers they will ask for your Key to the World card to scan. Your photos will be ready to view later that day. The number of your photo folder will then be shown. There are several different cabinets, all named after a Disney character, e.g. Mickey, Donald, etc. Each cabinet holds differently numbered folders. If your folder number was Donald46 you would go to the Donald cabinet and look in folder number 46. That is your exclusive folder for the whole cruise and is where all the photos taken on your stateroom card will be stored. Some photos may be displayed on the boards at the side of Shutters, especially those taken on Castaway Cay, so make sure you check there each day. You can then place those photos into your folder. The cabinets are only unlocked and photos available to view during Shutters' opening times, which can be found in your Personal Navigator and are also displayed in Shutters. At anytime during your cruise you can purchase prints, credits or a CD, although many wait until the last day. Prints are available to buy individually or you can purchase a CD of all photos in your folder. If you wish to purchase a number of prints, you can save money by buying credits which can be redeemed against the prints of your choice. If any of the prints in your folder that you wish to purchase are creased or have fingerprints on, just take them to the desk and request a reprint. All prices are subject to change, and are provided here as a guide only. Check onboard for latest prices.